Grandparent Names: What Do Your Kids Call Your Grandparents? My question for you today: How did you/do you address your grandparents? And how do your kids address their grandparents? I was thinking of this because of a birthday note that June received over the weekend. Along with a birthday card, my mom likes to include a little info on one of the kids’ ancestors — just a paragraph or two with maybe a photo. Sometimes it’s a long-ago relative that lived in another country many generations ago. But this time it was someone a bit closer, someone I spent lots of time with as a child — my mother’s mother, Lucille Evans Pack, or in other words, June’s great-grandmother. In the little note, my mom referred to her as GiGi, which is what her great-grandkids called her. I think that’s so cute — G.G., as in Great Grandmother! I’m not sure who thought to call her that. As grandkids, we called her Grandma Pack, so the name GiGi was only part of my life as an adult. Did she request it? Did one of the great-grandkids start it? Did one of my cousins or siblings suggest it? Or maybe it was thought up by one of her kids (my aunts and uncle and mother). It has me wondering, what will my grandkids call me and Ben Blair? What will their kids call our parents? I want it to be something fun. P.S. 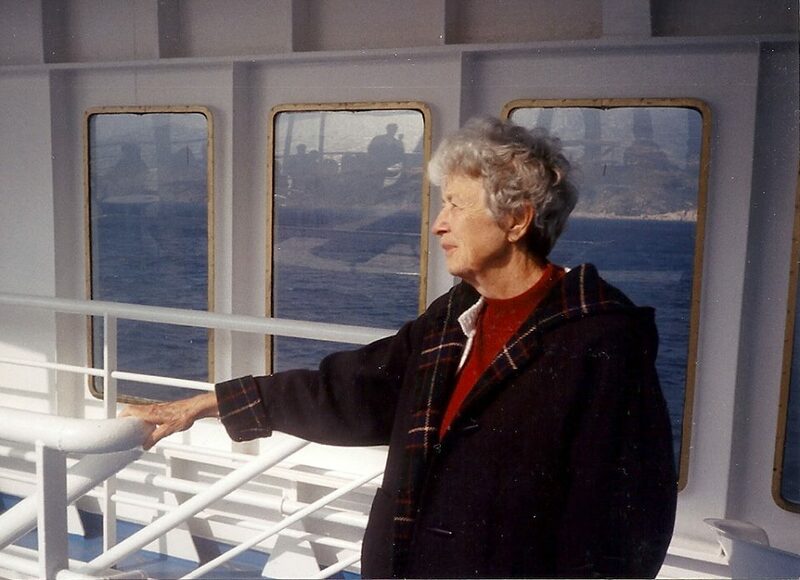 — The photo at top is Grandma Pack, age 82, on a boat headed to Santorini. She and my mom came to visit me and Ben when we lived in Greece. She even rode a donkey on the steep island paths! Oh my goodness! My great-grandmother’s name was Lucille Evans! Lucille Eliza Wilgus Evans, to be exact. Oh, how I loved her! Such precious memories of going to her apartment, getting to watch TV and eat Vienna Sausage sandwiches on Wonder bread with mayo, and lemon-lime soda to drink! At home, we never had sugar or store-bought bread, or really, anything processed. I’ll be smiling all day today, thinking of her. Growing up, I referred to all of my grandparents as Grandma and Grandpa, except for one grandfather, whom we called Granddad. My children call my parents Grammy and Papa, and my husband’s parents, Grandma Judy and Grandpa Fred. Oh. What a lovely comment! Now I’m thinking of happy memories of my own Lucille Evans. Thank you! My grandparents were always Grandma and Grandpa [last name]. Although my father’s father, who died a few months before I was born, is referred to as Granddad. As such, my father is Granddad to my daughter, and my mother is Grandma [last name]. My husband’s parents are Papa [first name] and Grandma [first name]. I joke about the fact that we can never buy off-the-shelf personalized grandparent stuff, because my daughter has no “Grandpa”, only Granddad and Papa [Name] (who doesn’t go by just “Papa”). My surviving Grandma is now Great-Grandma for my daughter. We have her 100th birthday to celebrate this summer! This is a great question! I have a Granny Doyle and Granny Corcoran and then a Grandad Brendan. When my great-grandmother was alive I used to call her Big Granny. I sometimes wonder what my parents will be called as grandparents but thinking of them at that ages quickly feels weird so I stop! This is a fun post. My grandparents and great grandparents on my dad’s side were MomMom & PopPop. On my mom’s side it was Grammy & Grandad. Then my stepdad’s parents were greek so they were YaYa and PaPou. On my husband’s side it is more formal. Greats were Great Grandmother and Great Grandfather and Grandmother and Grandfather and for our children they refer to their grandparents as just Grampa and Grandma (First Name). There are lots of grandparents for our children ! They just had to do their family trees for spanish class and lots of questions were raised. “Well, how come I have two Great Grandfathers?” My father passed when I was young and my mom remarried. My husband’s parents divorced and there have been new marriages on that side. We feel that they are so fortunate to have so many grandparents to love them. I miss mine every single day. My own grandparents were Grandpa (lastname) and Grandma (lastname). Which, now that I’m an adult and a parent, seems totally bizarre and formal! (Sadly they all died before I was 21 so I never knew any of them as an adult.) My MIL is Italian, so she goes by Nonna. My mom meant to be “Grammy” but the first grandchild made it “Mimi.” Kinda like your “Gigi”! And my dad goes by Papa. I do love the name Mimi! It’s actually the nickname we use for Maude sometimes. Love this post! My kids call my mom Nan or Nanny and my dad Bob-o. My daughter started calling him that when she was very young. I don’t know what she was trying to say, but that’s how it came out and it stuck. All the grandkids call him Bob-o now. My husbands parents go by Papa and Me-Ma. Don’t really know how Me-Ma came about either. The one great grandparent that is still alive is known as Grandpa Great. My kids call one set of grandparents Grandma and Grandpa, and the other set Oma and Opa. One grandmother was worried about potential confusion and chose Oma and Opa for herself and spouse. My husband and I are the grandparents of the three most adorable children on earth! Long before we had our own children, my husband decided that his grandchildren would call him Boss after reading the Faulkner novel, The Reivers. He worked diligently to teach the first grandchild how to say Boss. The next 2 just fell in line and now he is Boss. My initials are CC so I chose that as my “grandmother” name. We taught it to the grandchildren as well. Now we love being Boss and CC to three. Boss & CC. Love that! I don’t kids yet, and my parents don’t have grandkids yet, so I’m curious to see what they’ll end up being called. We’ve always called my mom’s parents Nanny and Poppy (and occasionally Nanna). I can’t imagine calling them Grandma Betsy and Grandpa John- it sounds way to formal for them (maybe because I was and am so close to them). My dad’s mom died at the age of 57, before I was born. I’m not sure if any of my older cousins had a different name for her, but we’ve always referred to her at Grandma Nea (her full name was Geannea, pronounced “ja-nee-uh”). Her husband, my dad’s dad is still alive, and we’ve always called him Pappy (my oldest cousin called him this out of the blue, and it stuck- my grandpa, a pilot and Korean War vet, loved that it was the same name as a famous World War II pilot). He remarried not too long after my dad’s mom passed away, and we call her Grandma Jeri. I’ve always felt she needed a different name- her name seems so formal! Most of my great-grandparents were called the more formal names: Grandma Ogden (her last name), Grandma Iris (her first name), Grandpa Decker (last name), etc, but my mom’s beloved grandma (and my namesake) went by both Grandma Liz and Mimi. Holy cow! That video blew my mind. I always called by grandparents Grammy (last name) and Grampy (last name). As someone else responded, it seems formal to me now. We hadn’t had any great plans for what our own kids would call our parents and they didn’t seem to have a preference. Nanny and Grampy turned out to be the names they could pronounce. My son (who loves) cars, named one Grampy Garage and the other Grampy RV based on what he likes to see at each house :) The names stuck and now I refer to them like that too. What a great question! My husbands grandparents are known as Marnie (her) and Dee (him) which are names they chose for themselves after deciding they didn’t really want to be Grandma and Grandad. I kinda love that they just took the opportunity to rename themselves! My own grandparents on one side were Grandma/Grandad [first name] and the other Grandma/Grandad [last name]. I’ve always wondered why one side got first names and the other last! My family is all French Canadian, so growing up, we had multiple sets of Memere and Pepere with the grandparents and great grandparents. My parents are now Memere and Pepere to my boys, and I know I will be a Memere as a grandmother. But I wonder if I will be the last generation to be called that in my line of the family. I know my husband won’t be a Pepere since that’s not his heritage, so if he is not, I would be surprised if my sons went with Pepere when they become grandfathers many, many years from now. My Mom REALLY wanted to be called Grandma. She thought the name was an honorific and she was thrilled when her first grandchild was born. She would call my niece on the phone and say, “It’s your happy Grandma!” So my niece started calling her…Happy! Now everyone calls her Happy, even her friends. Something very similar happened to my aunt! She always calls her grandkids “honey” so now they call her Grandma Honey, which just melts my heart. I love that the kids had a little hand in giving grandma a name (within her boundaries). Happy Grandma! My son went to an in-home daycare from the age of 9 months – 2 years. Miss Vera was the owner/operator, and she answered the door with tears of laughter when I came to pick up my son. She said, “Jett started calling my husband Honey!” My first husband and I split when my son was about 18 months old, and he’d never heard us refer to one another with pet names, so since Vera called her husband, Ray, Honey, Jett just assumed Ray’s name was Honey! Ooooh. I’m kind of into Bougie. My kiddo calls my husband’s mother, Grandma Kitty. Before she could talk, when she wanted to video chat with her grandma or saw her picture, she would make the sign for kitty because grandma always showed her the kitties when they talked via FaceTime. She calls my husband’s father PopPop because he would pop his cheek with his finger and again she’d try to emulate this when she saw pictures of him or wanted talk with him. Those names stuck and I love that she essentially named them for herself. The little girls I used to babysit called their grandparents Grandma & Grandpa Kitty and Grandma & Grandpa Donkey (for the animals they had I guess)…so funny! One of my aunts chose a very unique name for her grandkids to call her: Beezer! She loves it! Was the change of name successful? Was it too late once he was already Grandad? I do love Beezer! Reminds me of Ouiser on Steel Magnolias! My mother in law is Italian so my kids call her Nonna. My niece couldn’t remember great one day when referring to her great-grandma, so she called her Super Nonna. We have adopted Super Nonna and Super Papa for the great grandparents ever since! Super Nonna? Super Papa? That’s the best thing ever. My parents’ first Grandchild could not say Grandma. It was Bama. So for my kids they are Papa and Bama. Now my mom is Bama or Bam. When we are referring to them together as a unit they are Papabam. My great-grandmothers were Nawnee and MawMaw. My grandparents were Grandma/Grandpa and Nanny on my dad’s side, she was widowed so I didn’t have a name for my Grandfather. Now my mom wants to be Grandma. My grandparents are now Grandma and Grandpa Taylor (last name). It is a funny cycle. My own grandparents are Grandma & Dziadziu (ja-ju) which is Polish for grandpa. Now that I have a daughter who is 1.5 and interested in extended family and learning to speak she’s coming up with such sweet pronunciations of the names. Their official names are Grandma/Grandpa (very tradition for this side) and the other is Bachi (again Polish) & Granddad (being pronounced Dad-did or did-dad). I grew up with a Babci and Dziadziu too on my Polish side! I was surrounded by a Polish community growing up so didn’t realize how uncommon it was until I moved away from home. When I had my first child, both mothers were picking what they wanted to be called, and my mother was hoping for Babci. Well, my son had other plans – he came up with Ama (no idea where this came from). We distinguish between the Amas by inserting the name of their state after Ama (Ama New Jersey, Ama Connecticut). The name stuck! I love this post and comment thread! It came at a perfect time, since my kids’ school just had their Grandparent’s Day event last Saturday. I helped organize, which included assembling portraits and quotes about grandparents, and so was privy to some really awesome grandparent names. We had a Gheebee, a Fireman Papa, a few Nonnas, a Mimi, and lots of other really sweet, endearing names. In our family my grandparents were Grandma and Grandpa [last name]. My stepmom’s dad was Bumpa. My husband’s grandmother has always been called GiGi (despite her first name actually being Anne). My mom chose to be Nana, my dad is Papa, and my stepmom is Grandma Barbara. My husband’s dad is Popi. I called my mom’s mom and dad, Papaw Cecil and Gramaw Carol (first names) and my dad’s parents Grandma Ruby and Grandpa Harold (first names), my mom and dad wanted to be Mamaw and Papaw, but my son had other ideas…when my son was first born, my mom’s health was fragile, so she had to wear a blue mask…so she called herself Blue Gramaw…he talked early (4/5 mos) and used to call her Blue…at 1 year, she was allowed to remove the mask for good and he started calling her Mimi…no matter how many times she said mamaw…so Mimi stuck. :) On my husbands side, she has a Mamaw Cheryl and a Papaw Dan (his parents), then my MIL parents are Mamaw Smith & Papaw Smith (last names) and my FIL adopted parents are Gramaw Lorna and Pap Charlie (first names), so we are all over the board on first and last names. I called my Grandma Carol’s mom Mamaw Nina (first name) to distinguish the Great from the Grandma. My 4yo daughter says she’s a grandma already…so no clue what that makes me…LOL. My girls call my mom Marmie; from Little Women of course. We love it. My daughter was the oldest grandchild on both sides – and it was the biggest struggle for all the grandparents to decide what they wanted to go by. My mom settled on Oma for the Swiss/German heritage in our family and my dad just goes by grandpa. My grandma was named Louise and I always just called her Lulu. I love that name! My friends mom is named sherry – so when she first had grandchildren she said she would just be Grandma Sherry. The kids couldn’t say that very well so they called her Ma Sherry. It sounds like they are calling their grandma “ma chère” which I think is so sweet! My mom is Nana to the girls. Or rather, was. As a joke, years ago my husband started calling my dad Manna… like, the man version of Nana. However, when Cora was referring to them, we could never differentiate who she was talking about because the two names sounded so similar. This frustrated her to the point where, when Cora was about two, she just started calling my dad Two-Nana, so of course my mom evolved into One-Nana. The kids have been calling them that for three years now, and it still cracks me up. The other grandparents are ChiChi, PawPaw, and Belle. My kids have grandad & grandmum on my side and babcia & jadek (Polish) on my husbands side. When we have grandkids will will be nana & papa. My boyfriend’s grandparents are Granny Sally and Grandbud– I’m not sure what his first name actually is, but his nickname is Bud, and grandbud just fits so well! *If* I got to choose I think I would have gone with Gigi, my sister did that with her grandkids -adorable, and fits her perfectly. That said, other grandkids were already in the mix with the in laws so we kind of fell into our names. All our grandkids call us Gramma Penni and Grampa John, while the other side of the fence gets Papa Joe and Gramma Beth; another set get Gramma Kim & Papa, and another set use Nana and Papa. I heard an interview with Leslie Stahl on NPR this weekend, who goes by ‘Lolly’ to her husband’s “PopPop’. Love this — my mom literally “called” Nana, she was like “I want to be called Nana so no one else can.” haha Grandpa is Papa because she could pronounce grand! I might switch to bubba and ace just to get a good laugh! I had one set of grandparents as a kiddo, so they were Grandma and Grandpa (sometimes Grandpop). Then my dad remarried and I got a second set of grandparents via my stepmom, and they quickly became “Grandma Ada” and “Grandpa Joe”. When my mom was about to become a grandmother for the first time herself, she thought “grandma” sounded old and was thinking about having my nephew call her “Nana Dana” instead. Well, the kiddo settled on “Gamma” and my dad is now “Pop-pop,” so ultimately, I think it depends on what the kiddos can manage to call you. My mom wasn’t too upset–she quickly decided it didn’t matter what she was called, as long as she got to spend time cuddling her grandbabies. On my side of the family, it is Grandma/Grandpa and thus Great-Grandma and Great-Grandpa. On my husband’s it is Grammie and Granddaddy— thus Great-Grammie and Great-Granddaddy (there has never been more than on “great” set surviving on each side so no confusion about that, sadly). My kids call my mother Nana. We were not planning that, but they sort of took to that name and my mom liked it. My mother-in-law is called Nanny. She wanted to be called that because that is what she called her grandmother. However, she is Italian so I expected her to be called Nonna. I think it is unusual, but since that is what she wanted it is what my kids started to say. I just said the usual grandma and grandpa with my grandparents! I should mention though, where we live in West Virginia, everyone calls their grandparents MawMaw and PawPaw. It sounds so strange to me, but it is what everyone says. In my family the grandkids (my children) called my parents Grandma and Grandpa. My husband’s parents lived out of state and were not seen as often as mine. My kids called my husband’s parents Grandma Gladys and Grandpa that seemed to separate the two couples to them. When my sister and I became grandmothers, it was confusing to the great grandkids at family gatherings with all the “Grandmas”, so my mother became Grams (my dad passed away before that became an issue). I don’t have kids yet but my nephews call my parents the Welsh names Nain (pronounced Nine) and Taid (pronounced Tide). The kids don’t even live in Wales but it’s the one bit of Welsh that they’ve taken with them to England! My grandchildren call me Tootsie or Toots. My first grandchild was due to arrive right before Obama’s 1st presidential election. His maternal grandmother, who played a major role in his upbringing, died the day before the election. He called her the Hawaiian “Tootsie”, so my daughter in law and I decided to use it too. I love the name and I love Obama. I don’t have kids but my sister just had twin boys. My Mother wants to be called Honey and my Dad will be Pops. Their other grandmother is Nan (her real name is Nancy) and their other Grandpa is just Grandpa. I have heard of GiGi before too. Oh and we call my maternal Grandparents Mimi and Bop-Bop because my sister muddled up up Pops. My older daughter (the first grandchild on my side) called my dad “pa” before she had a name for my mother. When she next looked at my mother and made a sound, my mother declared she said “Grackie” and that became her grandmother name. She is Grackie to her grandkids and Greg-grandkids. Mi use my first name. It is unusual and close to the German name for grandmother so it works. When my older granddaughter, was in kindergarten, her teacher asked her what a homa was? It’s funny, all of the grandparents are “Gramma” and “Grampa” with the exception of my mother, who is Mormor, which is Swedish for grandmother. We live in an RV, so we are called Grandma and Grandpa RV by our grandsons. My ex is Grandpa NY and the southern grandparents are MeMaw and Papa. My friend is called Ninja by her grandkids, not sure where that one came from! My girls call my parents “Grandma” and “Papa.” However, my husband is Welsh, and so they call his parents “Bampi” and “Nana.” We will hopefully continue my husband’s family tradition in the future; I like holding onto culture and history. My kids call my husband’s parents Nana and Pa. My dad and his wife are Grandfather and Grandmother, and my mom wanted to be called Matani (supposedly an African name for grandmother. My kids never took to that so they call her Grammy. I called own grandparents Mimi and Poppop. Mimi got the name from a little neighbor boy who started calling her that. Whom was my G.G. When my kids were born Mimi naturally became G.G. The best name I’ve heArd for grandparents is from a couple in our cjurc. They are Lolli and Pop! I think that is adorable. My mother would have no part of the grandma, grandmother business and appointed herself ‘Kitty’. My parents have always called each other ‘Bear’, so my children pretty quickly came up with “Grandbear”…So it’s Kitty and Grandbear, which is pretty darn cute! Fun thread! My grandparents on one side were Grandma and Grandpa and on the other, Lulu and Pop! (Everyone called my grandmother Lulu.) Now, for my children’s generation, my parents are Grandad and Granny, my dad because some of the grandkids called his dad grandad and my mom because her favorite grandma was called granny, and she wants to be just like her. :) I find it amusing that my very young feeling 62 year old mom is a granny, but that’s what she wants, so who am I to contradict? Besides, grandma and grandpa on only one side makes things so easy. I call my grandparents on my mom’s side Granny and Papa, and on my dad’s side Grandma and Grandpa. My parents are now Gogi and Papa. My mom wanted to be Granny (the Scottish tradition), but my oldest nephew couldn’t say Granny when he started to talk, and Gogi just stuck! When I was a child, Grandparents names were very formal (i.e., Grandma and Grandpa Park). When my children were born I wanted something unique, as we had 3 sets of Grandparents and a Great Grandparent to consider, and I wanted the Grandparents to have a choice. My husband is German, so his parents decided on the traditional Oma & Opa. My mom & step dad went with Mimi & Papa. My dad & step mom went with Pop & Sassy. My children’s Great Grandmother liked tiny GG (she is 4’4″). I love that they each have a unique name to go by (and since my kids are the oldest grandchildren, all of the other nieces and nephews have chosen to use the same names). I think the grandparent has to help orchestrate the name they want. It may feel contrived at the time but if they don’t, it’s hard to change. GG in our family announced the name she wanted early on. Grandma Rudi wanted Guru but it was too late and didn’t take. It seems inappropriate for a child to call a mature person by their first name, so having a grandma nickname takes care of that for others, too. My parents have friends that taught their grandkids to call them Duke and Dutchess. Love that! One of my besties is Puerto Rican and so her mom is the Abeulita, but they have shortened it to Wellie, and I love that. Ours are my husbands parents, Oma and Opa, and on my side my Mom, who is called Nana. Such fun comments to read! My son is oldest grandchild on my side of the family. My Dad thought he would be called Pappy as that is what he called his Grandfather. Turns out Parker called him Pop Pop instead of Pappy and the name stuck. He’s now known as Pop Pop to his 6 grandchildren. For my parents: Grandma and Grandpa. For my husbands parents: Nana and Papa. My husband and I will be Nana and Papa when we are older I think. I am the oldest grandchild. My grandma was young, and NOT interested in grandmothering. On my own, I called her ‘Maman’ when I learned to talk (they had lived in France many years with their young family, and all spoke fluent French). She melted, and has been Maman to all of the grandkids ever since. Both sets of my grandparents were Grandma/Grandpa and we used last names if we had to distinguish. My mom is Grandma to my kids, my dad, however is Rascal because that is what he calls the kids “little rascals” so they call him that back. My kids are lucky enough to have three greatgrandmothers, they call them all Great Grandma and use a last or first name if clarity is necessary. and a Nani and a Papa–my dad’s parents. she never liked being called Nani, and always referred to herself as Grandma Bella–which is what my cousins called her. But we never called her that! I didn’t realize how southern I was raised until I went to college and people didn’t call their grandparents “Mamaw” or “papaw”. I was shocked!!! My kids now have grandma and Mimi. As typical for my generation, I just called my grandparents Grandma and Granddaddy when addressing them, and added (last name) when talking about them. When my kids were born, my husband’s parents were already called Grandma and Grandpa by their other grandkids, so my parents wanted something different. My dad went with Granddaddy which is what his dad was. My mom chose Nana because she just liked it. My kids call their grandparents by “Grandma [first name]” and “Grandpa [first name].” We live in the South were it’s common to call adults by Mr. or Ms. followed by their first name. I love how it gives respect to adults but also seems a little more personal than using last names. I love this…I think it is still respectful, but a little more cozy than using a last name. I always addressed my aunts and uncles this way. My son was born in Switzerland, so we initially referred to grandparents as Oma and Opa. As he got older and more verbal, he combined his love for Elmo with Oma to get “Elma.” He now has an Elma and a Papa. My nephew calls these same grandparents Gaga and Papa and his great grandparents O. Gaga and O. Papa. (With O being short for old). I learned to speak while my dad was stationed in Denmark. I called my mom’s mother, Mormor, which means exactly that; mother’s mother. Her father was Morfar; mother’s father. My dad’s folks were always Grandma and Granddad. For my grandson, I am his Mormor and my son-in-law’s mother is the Brazilian Vovó. Gotta love international families! My grandparents were Nana and Poppa, great grandmother was Gigi. Those are the only grandparents I knew. Typing this makes me wonder…what do other people call step-grandparents? Was also just thinking of my best friend’s parents – when she found out she was pregnant she teased them that they would be called Mopsy and Poppy. Her daughter is the oldest though, and it stuck – Mopsy & Poppy they are! My sons call my father-in-law Poppa and mother-in-law G.G.–short for Grandma Graham! :) And my sons and many of their cousins call my mom Bobba and my dad Poppy. Both were dubbed by our oldest niece as she was learning to talk. And both names stuck! Oh and I called my mom’s mom many names growing up–led by my silly sister. Like Gwerma, Gwerms, Gwermcracker, haha! She just laughed right along. I really like Poppy – so sweet! My great-grandmother designated herself Granny Great before she ever had great-grandkids. And so now my children call their great grandmother Granny Great. Growing up we called one Grandma Konold and the other Grandma Brown. But a cousin down the line started calling Grandma Konold by her first name, and we all loved is so much we now all call her Grandma Sunny. This summer my kids will meet their step-grandma for the first time (my husband’s father recently married after the death of his first wife, and we live overseas so they haven’t meet yet). I’m not sure what to call her. My husband had a similar situation growing up and they always just called her by her first name, which to me seemed kind of sad. My kids are so young this will be the grandma they remember. I don’t want to her or them to feel like she’s not “real” because she’s not their father’s mother. I want them to have a loving relationship with her and somehow having a title seems to be part of that. Or maybe I’m just making something out of nothing. When we were little, we called them Grandpa Len, Grandma Jean, etc. Now we call them Gram and Spanky, Mutti (German for ‘mom), and Grandma Joan. My aunt’s first grandchild came up with/randomly started using the name ‘Mugga’ for her. She had that one grandchild for 7 years before she got anymore but now she has 12 grandchildren and 1 great grandchild and they all call her ‘Mugga’. It’s so unusual! My only living grandmother has about 5 different names, depending on which of her 27 grandchildren, or 11 (so far) great-grandchildren you ask. I’ve always called her “Memaw”, which I pronounce “Meh-maw” with a soft “e”. She also goes by “Mamaw”, “Granny”, “Meemaw” and “Geemaw”. Interestingly, my mother (one of her daughters-in-law) calls her “Granny”, and was apparently encouraged to do so shortly after she married my father. At that point, my grandmother was barely in her 40’s, and still had 8 of her 10 children at home, including a toddler. I guess she was looking to the future? Her husband went by “Pop [Last name] to the older grandchildren, and “Peppaw” or “Poppa” to the younger set. My deceased maternal grandmother was “Mamaw” and her husband (who spent most of my life in a Veterans hospital) was “Papaw”. Papaw’s mother outlived him by more than a decade, and I called her the comparatively formal “Great-Granma”. When my mother found out that she was to be a grandmother, she very deliberately set out to pick a name. For the longest time, she tried to force my nephew to call her “Grand Mom”. Toddler force of will had its way, and she quickly became “GeeGee”. My MIL wanted a name that didn’t sound super Grandmotherly – so she is Granna. I love this topic! It’s fun to read everyone’s responses and see all the different names. My side of the family uses Grandma and Grandpa. My husband’s side uses Mamaw and Papaw. I’ve told my husband and kids that when it comes time for us to be grandparents, we’re going to break the tradition and be called something different. I really love GiGi or MiMi and I also like Nana. I don’t think my husband will go for anything other than Papaw. He was so close to his own Papaw and he was such an influence on his life that he sees it as a sign of respect to carry on that name. We have friends whose kids use the names Grandy and Pop – I think those are sweet, too. My mother was called Grandma Beans, because she always had Jelly Belly jelly beans in her purse for the grandchildren. When she passed away, we had huge bowls of jelly beans at the funeral. Every Christmas and Easter, I put Jelly Belly jelly beans in all the grandchildren’s stockings and baskets, so the kids remember their Grandma Beans. For reasons no one can remember we called my great grandmother Granny Grunt. She even had a hand painted sign on her front door. I never even thought it was strange until kids made fun of it at school. My parents are PopPop and Nini. My husband’s Spanish mother is Yaya and his Italian father is Nonno. My husband has already decided he will be a nonno rather than an abuelo. Fortunately I have quite awhile before I acquire mine. My mother’s grandparents, my great-grandparents, were GeeGee and Granddad. My mother’s parents, to me, were Gram and Grampa. My grandfather passed away when I was 11. My grandmother had the opportunity to meet two of her three great-granddaughters. When my husband and I started dating, he jokingly referred to my grandmother as “Yoda.” She was wrinkly and awesome and all of barely five feet tall, hence the nickname. When my oldest was learning to talk we never censored ourselves when talking about “Yoda.” She started referring to her as “Gramma Yo-Yo.” Now, my grandmother was a very proud woman and could not understand how her great-grandchild could refer to her with a slang term reserved for slightly nutty folks. Finally, one Thanksgiving, my husband filled her in on how the nickname came to be. She passed away in January 2011, 6 months after her second great-granddaughter was born. We now all refer to her as Gramma Yo-Yo. My parents are called MeeMee and Papa/Pop (as I called my father Pop as a child, he never liked the word “Dad.”) My husband’s parents are called Mimi and Grandpa (sometimes Mimi Next Door to differentiate, as we live next to my in-laws). I love all the variations here! When my son was born I figured it would be the same, my dad would be Grandpa John. When my son started talking he very clearly declared that my Dad was “Yeatah” which we can’t figure out (maybe short for Yay Grandpa!? ), but it’s been his identity ever since! I had Nanny [last name] and Nanny [first name], no living Grandfathers. Now my kids have: Nana & Grampy, Grammie & Grampy, and Papa & Farmor (Danish anc. – father’s mother) since my husband’s parents are remarried – all requested by themselves. If asked today I’d be called Gran. We are 7 months pregnant with the first grandchild on both sides, so we JUST had this conversation! I will be Mommy, and my parents will be Mimi and Poppy. My wife will be Mamma, and her parents will be Nana and Papa. I like the “E” sounds on one side and the “AH” sounds on the other side, haha. My grandchildren call my husband Guppy — which is a toddler’s corruption of Grampy which was my husband’s choice for a name. We absolutely love the name Guppy — so original! My mother-in-law was called GaGa by her grandchildren. It too was a child’s corruption — of Grandma. She loved the unique name — perhaps not the connotation so much! Wow, this is fascinating. In Sweden the maternal grandparents are called mormor and morfar (literal translation would be mothermother and motherfather). The paternal grandparents are called farmor and farfar (fathermother and fatherfather). Using other names than those would be very uncommon. My mother called her parents Mama and Papa, so we called them Grandma and Grandpa. My father called his parents Mother and Dad, but when I was learning to talk, he called his mother Marjie to be cool. So I tried to call her Grandmarjie, but it came out Grandmernie, and I called his father Granddaddy. I was the first grandchild on my father’s side, so Grandmernie stuck! My Mom has stipulated that she’d like to be Grammy for all future grandkids, while my Dad has yet to have an opinion. I want his to be special though, as I know grandkids will be absolutely crazy about him. My partner’s Mom has put in her bids for GG, but for her that is “Gorgeous Grandma”. My own grandparents were Grandpa and Grandma, for most of their “careers”, but when I was ten (and the youngest grandchild) I started Gma (prounounced Gee-Mah) and it took off. I love that she had her own unique name. I only had one grandparent alive by the time I was old enough to talk, and she was Grandma Forrer. Great’s were Great-Grandma/pa (Last Name). My husband’s family always went with Grandma/Grandpa (first name). (Not sure on Greats.) He had all of his grandparents through high school. One passed away a few short years ago and the other two are still going strong. My kids call them Great-Grandma/Grandpa (first name). As for my kids’ grandparents, our moms are Grandma (first name). My husband’s dad is Grandpa Goofer. His name is Gary, but he truly is a huge goof. The first grandkid gave him the nickname and it has stuck. Hard. We live in a small town, and quite a few folks now call him Grandpa Goofer! :) Oh – and my mom is known ALL over town as Grandma Pat. Which is just an extension from when I was in school: she taught in the same school district so for a number of years she was “Mom Forrer” to my brother’s and my class mates. My maternal grandparents were Grandma and Grandpa [Name]. My paternal grandparents were Granny [Name] and Pompa. Pompa came about because I, as the oldest grandchild, couldn’t pronounce Grandpa properly. Over time those changed to Gran and Grandpa. But I use Granny [Name] with my kids now. My Pompa has passed but I would have loved for them to call him that. My kids have three sets of grandparents. My husband’s parents are Grandma and Grandpa. My dad and stepmom are Grandma and Grandpa too. We add first names if clarification is needed. My mom and stepdad are Nana and Abuelo, which they chose. When my triplet granddaughters were born almost four years ago the Grandmother naming began. “Mimi” was taken. Ditto “Cici”. Not going for any “Granny” names I decided I would really branch out and told the family I wanted to go by my favourite name of “Kate”. They laughed for two weeks. So- scratch Kate. I LOVE Coco, the fragrance by Chanel. Well, if I couldn’t have Kate I would go for Coco, and Coco I am! I come from a long line on my mothers side of women who let their grandchildren “come up” with a nickname on their own as toddlers. It’s so great. My great-grandma’s name was Ella, toddlers converted it to “LaLa”, so she was “LaLa” forevermore, even to her friends. Her daughter, my grandmother, was Mary Frances, toddler converted to “Tancie”, and she was “Tancie” from then on, again, even to her large circle of friends. Signed her name that way, etc. My mom is Marybeth, toddlers started with Ma-Ba, which I wish had stuck, but soon became “Bethie” which is her adored name now. I just think it’s all so much better than any “grandma-esqe” name. Can’t wait to see what my grandchildren come up with!!! My grandparents are/were Nannie and Papa / Grandma and Grandpa. When I met my husband I thought it was so funny his grandparents were all called the same as mine!